Happy Pumpkin Day Fest graphics, video and audio are a copyright of Rainbow Productions, all rights reserved and may not be reproduced without prior consent from Rainbow Productions. Studio Camera is now on line most of the time while the girls are practicing. The camera software updates the site once per min with a high quality jpg picture. The girls practice on weekends mostly and that's when the camera will be on. Generally from around 10 am until about 6pm. Sometimes if our AOL is on line you can chat with them via IM or ICQ providing one of our accesses is on line. 12-1-2000: I thought I had updated this page but I guess I got busy with other things and forgot it. HPDF 2000 was a huge success. There was Magic, songs, dance and contests. It didn't rain so we had our backyard party as well. Everyone had a GREAT time. There will eventually be a video made of the party, it's all done except for the closing segment. Since I have been building a new Windows ME OS on this computer all video projects have been on hold. 9-9-2000: The girls are working on the show for Happy Pumpkin Day Fest 2000 at this time. Mostly on weekends and if all goes well I should have a studio camera set up out there to take snapshots of what they are doing in the studio when they are working out there. This year the show will be held on Friday Oct. 27th. It should be the best and biggest show ever. We will have a lot of the regular skits, games and songs as well as Stephanie Rainey (ventriloquist) with "Dannette," Jessica Browning to sing and conduct the singing contest part of the show. We will also have a special magic segment of the show where the kids will work their wonders before the audience to surprise and amaze. The activities start at 6pm but people may start coming anytime from 5pm on. I have also heard there may be a surprise visit from another celebrity (singer/song writer/ TV show host) join us at some point during the festivities. The regular program provides for an indoor show lasting up to 2 hours in length then if it doesn't rain we move the festivities to the back yard where we continue the show with music, song and dance and a back yard open fire and perhaps grill cook-out. Admission, food and candy are free but there will be items, shits and other things for sale during the event. Proceeds go to help fund and pay expenses for the girl's productions including the HPDF each year. I'll be hooking up the studio web cam sometime this morning. It takes snap shots of the girls working in the studio so you can see what they are doing on line here. If I knew how to set up a live streaming video to the site I would be happy to so if someone can help me with that I would appreciate it. I'll be adding more news here as I get it so if you are interested in the show check back often. I really don't try to sweeten the story or intend to mislead anyone, I try to tell the story as accurately as I can so here's what happened. This is the first year that we have intended to provide both audio CD's made just for our HPDF show and custom made "T" shirts. After drawing and painting several large decorations on the background of the set it started raining again and didn't quit until sometime early this morning. Needless to say we had to cancel our plans to have the back yard part of our show and all of our time, paint, and money spent was for nothing. This was Laura's first year where we turned the entire stage show over to her. She wrote and directed it but it was not without its own problems. While it was humorous without a doubt most of the comedy was a result of her actors forgetting their lines. Playing to a packed house with over-flow visitors watching from the living room TV including Jessica Browning one thing after another went wrong on stage, the more that went wrong the more they forgot their lines. I must commend the young actresses on their cool and ability to roll with the punches. With all the things that went wrong many would have just thrown up their hands and walked off the stage but these girls refused to give up. They managed to get very near the end of their skits and even have a game to give away prizes when Jessica saw they were in serious need of help. When Jessica walked up on the stage and took the microphone the entire atmosphere of the show changed. This girl glows with personality and professionalism. It's not every day that we have a real professional to appear in our little studio but she was a true Godsend. She talked to the audience for a few moments then sang several songs to which the crowed room responded with applause. Then she started a Karaoke contest and allowed members of the audience to come up on the stage and sing. She judged the contest and awarded some of the prizes. Jessica is invited to appear at our year 2000 HPDF and I'm sure that Laura and the rest of the crew will be able to put on a much better show next year. We were pushed for time this year because of some video jobs we were working on that ran longer than we had expected. The girls didn't have as much time to practice their skits this year because of that. Even now we are gearing up for the Children's Theater production of "Best Christmas Pageant Ever." It's a classic in this area and a tradition for Children's Theater in the Fort Smith, AR area. You may like to visit their website here at our domain. 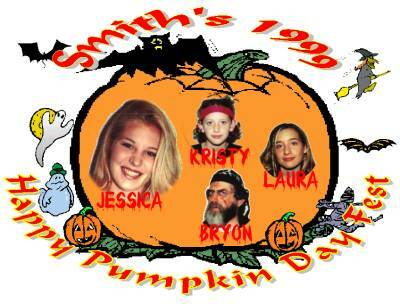 Yes my friends it is that time of year again and we are getting ready for the largest Happy Pumpkin Day Fest ever with songs, skits, comedy, contests and games here at the Smith Ranch. We have a headliner this year, Mrs. Jessica Browning will be singing some of our favorite songs on the stage behind the house. All the food and treats are free as usual but there will be items on sale also as usual and some of those items will be prizes at the party for contestant winners. Besides the regular Happy Pumpkin Day Fest items that we normally sell, things with rubber bats, etc. There will be Pictures, "T" shirts with the Happy Pumpkin Day picture (similar to the one above) there will be a first time ever Happy Pumpkin Day Fest CD with songs by Jessica Browning. She will also be selling one of her own albums at the festivities. We have been so busy here I have not even had time to build this website but wanted to get something up here just the same. Also from time to time the Studio Camera will be on line with nearly live shots inside the studio. Jessica Browning is going to be here all day Saturday do help with the festivities and will be doing a recording session in the studio Saturday morning Oct. 30th. I expect the Studio Camera will be on to uplink a few pictures at that time but since I intend to do all the recording directly into this computer I can't leave it on line. Wish I had another computer that I could just dedicate to the Studio Camera website. The way it is I do everything, make CD's, videos, record audio, design logos and pictures like the one on this page for "T" shirts and cd labels. You name it I do it on this computer. Yes that picture is not finished, that's something else I have to do and the new one will have pictures of the HPDF pirate crew including Jessica Browning. It will be printed on the "T" shirts and other things for use, to sell, to give away Oct. 30th at the show.